Time for your second chance! 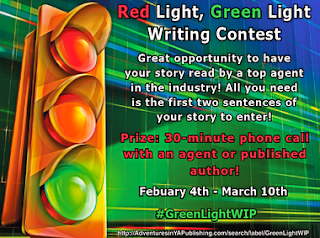 Our Red Light/Green Light Contest, judged by lovely literary agent Patricia Nelson of Marsal Lyon Literary is now open to take the next 25 submissions! This submission window will remain open until we've filled all 50 contestant slots plus some additional alternate spots in case of disqualifications. Ready to enter? Go HERE NOW! ALL YOU NEED IS THE FIRST TWO SENTENCES of your MG or YA Novel for this round.